Wednesday, October 6: Northern finches and nuthatches move south when cone crops are poor. 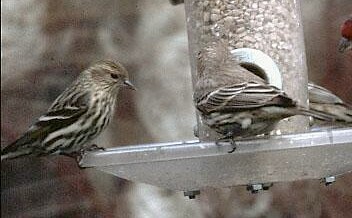 Purple Finch, Pine Siskin and Red-breasted Nuthatch are being widely reported in Windsor and the county which likely means few cones are present on spruce trees in central and northern Ontario. Monday, October 25: Late migrants have been widely reported in Windsor due to the continued mild weather. Fred Urie found American Redstart and Orange-crowned Warbler Oct 22 at Memorial Park while Oakwood Bush had Yellow-throated Vireo, Blackpoll Warbler (3), Orange-crowned Warbler(4) and Grey-cheeked Thrush the same day. Ojibway had American Redstart, Orange-crowned Warbler and Black-throated Green Warbler on October 25. Sunday, October 31: Rain and high winds over the past few days have resulted in heavy leaf drop in the region. Most trees are now bare of leaves except for a few oaks and non-native trees such as mulberries and willows. No frost has been recored so far this fall.